Located at 15 E. Eighth Street in downtown Cincinnati, “Martha, the Last Passenger Pigeon” mural, is a beautiful piece of art inspired by wildlife artist, John Ruthven. The mural was a Summer 2013 project of ArtWorks, a non-profit organization that trains local youth to create art. 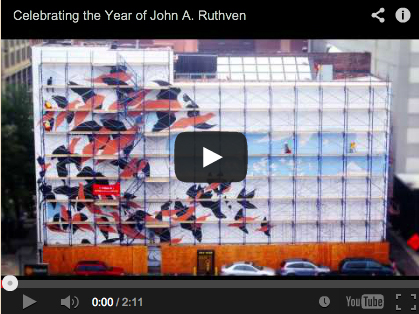 This entry was posted in Communities, Video and tagged ArtWorks, Downtown Cincinnati, John Ruthven, Martha mural by susanaknabe. Bookmark the permalink.